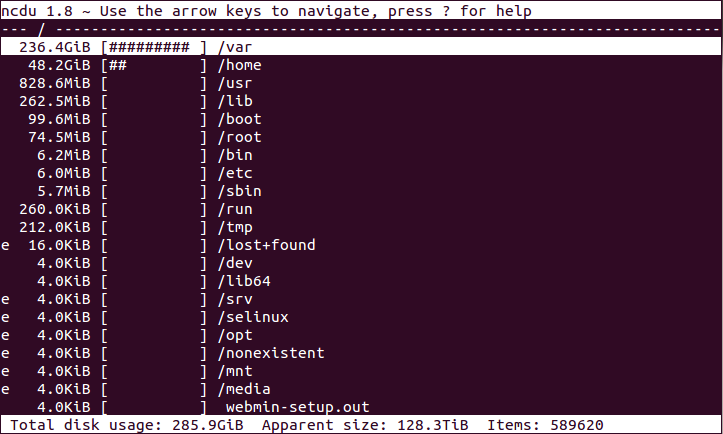 When you are trying to analyse disk usage there are a limited set of command line tools on Linux. Most people use either of ‘find’ or ‘du’. However using these tools it can be a lot of work to get an overall picture and drill down into directories to find the problems. Enter ncdu (short for ncurses-based disk usage). Simply put ncdu is a fanatastic graphical disk usage analyser. It could not be simplier to install. And you get a lovely screen like the one below. You can then navigate around using the cursor keys.